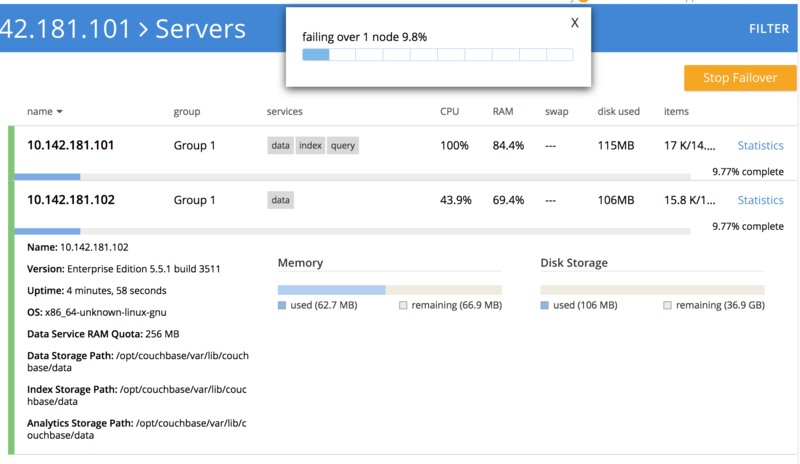 After failover has occurred, before the failed over node has been rebalanced out of the cluster, the node can be recovered, and thereby reintegrated into the cluster. This is useful in circumstances where, following failover, the unhealthy node has been fixed, and is therefore now assumed fit for re-addition. There are two options for recovery, which are full and delta. These are explained in Recovery. 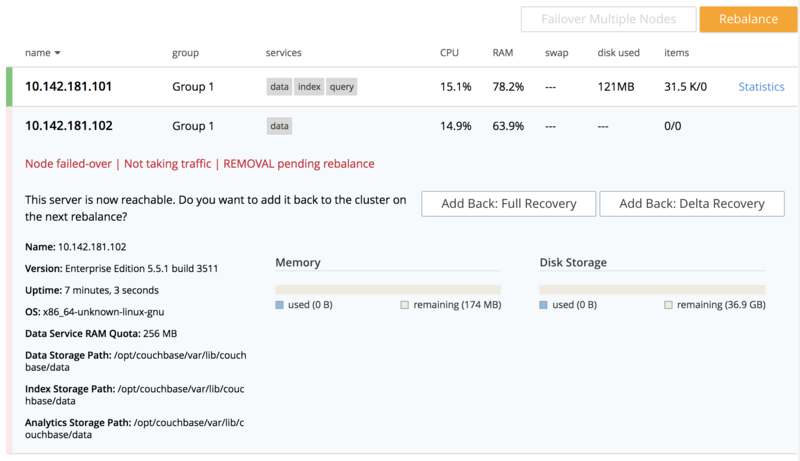 A two-node cluster already exists, as at the conclusion of Join a Cluster and Rebalance. The row specifies FULL RECOVERY pending rebalance: therefore, left-click the Rebalance button to apply full recovery. Similarly, left-clicking on the Add Back: Delta Recovery displays DELTA RECOVERY pending rebalance. Note that recovery can be aborted, by left-clicking on the CANCEL ADD BACK button. Left-click on the Rebalance button. Whichever form of recovery you have chosen, full or delta, is performed. For more information on rebalance, see the command reference at rebalance. For more information on recover, see the command reference at recovery. For more information on /controller/startGracefulFailover`, see Setting Graceful Failover. For more information on /controller/setRecoveryType see Setting Recovery Type. For more information on /controller/rebalance, see Rebalancing Nodes.